You can see from the chart below that the average person gets 320 mrem (milliR’s) per year. Below the chart I did the math to figure out how much radiation that equals per day and it is 844 microR (UR). What we didn’t understand at first was the ion chamber (and this is a $10,000.00 dosimeter) was far less sensitive than our 1200 speed CR cassette. This is why we were still getting images of the hand at distances where our dosimeter was reading zero. We spoke in depth to our physicist who said we would need an ion chamber the size of a 5 gallon jug to be sensitive enough to pick up 5-10 uR’s and that my 150cc ion chamber is incapable of such sensitivity. As an important aside, your badge monitor is also incapable of picking up such minute radiation, so be aware that you can be getting radiated daily with small enough amounts that it doesn’t show up on your monthly badge reports. What we concluded from this research was that although the dose is small, it is not insignificant. If you go out and shoot 5 PCXR’s in a day, you could already double the dose you will naturally get in a given day. As a radiographer is potentially around radiation all day long, this means one should always be wearing a full lead apron with a thyroid shield, and standing behind the tower of the portable machine when doing mobile x-rays. Love the articles and experiments – I get them on linkedin too. per day. In another article you wrote 85. 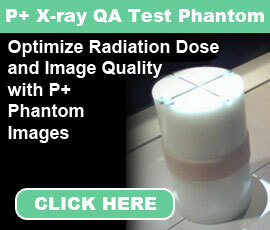 Also, when I use this converter http://www.convert-me.com/en/convert/radiation/ using 320 millirem as the annual background natural dose, I get 1008 microroengtens a day. That’s not too far off from 844 and I’m sure the ’85’ was a mistake. Thanks for clearing that up. I was shocked and dismayed by what I read in your ‘Off focus” experiment a year or two ago and by the ‘AP chest scatter radiation’ experiment. I’ve taken hundreds of portable AP CXRs, usually with no lead, and only 6-10 ft away. How wrong was that? I needed to be at least 14 ft away if not more. Or of course realize I must WEAR LEAD ALL THE TIME! Thank you and I wish I knew this 8 years ago! Sorry I didn’t reply sooner, but I just saw your note this morning. Weird. Anyway, In my talks I write that the annual background natural dose is 302 millirem, not 320. What article did I write 85? I’d love to go back and see if I could change that because for sure that’s a typo I didn’t catch.